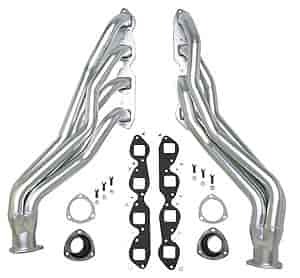 JBA 1822S-3 - Shorty Headers 1988-1993 C/K Series Pick Up 7.4L 454SS w/o Air inj. Due to cylinder heads (aluminum) generation 6 engines, 502 BB Chevy will have clearance problems on some applications. Bottom of hedder flanges may hit head bolts. Notching may be necessary. Does Hedman 69850 fit your vehicle? Is the sensor bung, installed, or in the box for this header 69850?